When is the last time you go on a picnic with family? Do you usually have to check your schedule to make sure you really have free time? What about this weekend? There is no need to go to a far place just to have quality time with your loved ones. If you stay in Tokyo, you can visit Hama Rikyu Park. Hama Rikyu Gardens is located at the Sumida River’s mouth on Tokyo Bay opened for public. Surrounded by Shiodome district scrapers, this park looks like a small oasis where visitors can feel the real sense of Japanese nature and tea. Before being opened for public, Hamarikyu Park was first a reclaimed land owned by the 4th Tokugawa Shogun, the younger brother of Ietsuna in 1654. He built a residence called Kofu Hama-yashiki or Kofu beach pavilion there. From that time onward, the park has passed some renovations done by the Shoguns. But after the Meiji Restoration, this garden turned into a detached palace and was used by the Imperial family. The name also changed becoming the Hama Rikyu or Hama Detached Palace. But the Great Kanto Earthquake and World War II bombings destroyed the garden, making it almost unrecognizable. Once handing to the City of Tokyo and opening for the public in April of 1946 by the Imperial family, Hama Rikyu was added with some unique features. It is including a tea house on an island as the main sightseeing spot. Now, Hama Rikyu is known as a natural gateway to enjoy four seasons in Japan. The pond water is taken from the bay, which is the only seawater pond remaining within Tokyo. there are also man types of ocean water fish living in the pond, like sea bass, black mullet, gobies and eels. A large pin was planted to celebrate the renovation of Hama Rikyu Park. It was the time of 6th Shogun, Ienobu. This pine has survived until today. Kamoba is a duck hunting site. There are two in the park, i.e. Koshin-do Kamoba that was built in 1178 and Shinshen-za Kamoba which was built in 1791. There are also duck blinds used to observe the ducts and feed them. When they get closer, they will be coughed using nets. It is a long bridge made from “hinoki” or Japanese cypress. Completed in May 1997, the 118m long bridge connects Kono-Ji Shima with Nakajima. From the firstly built in 1704, the tea house has been continuously used by the Imperial family. It was renovated in 1983. There are 1000 plants in the garden consisting of 60 different types of peonies. They usually bloom colourfully in the spring. It also looks beautiful in the fall. There is an alternative transportation mode after the train, i.e. the boat. It runs from Asakusa where wheelchair users can also get on. However, some docks are not accessible. 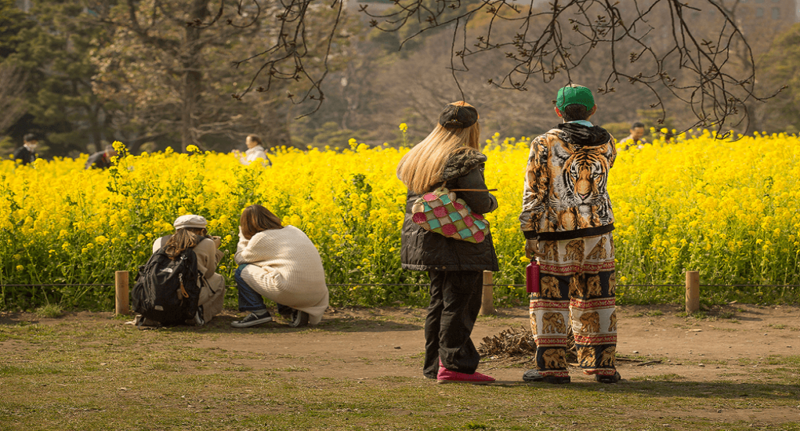 There are different events based on the seasons held in Hama Rikyu Park. You can simply save the date. But it is also possible to visit the park on the weekend as it opens daily from 9 am to 17 pm with the last entry is at 16:30. Hama Rikyu Park opens for the public, whether it is domestic or foreign visitors. It means you can also come by to this garden when visiting Tokyo, maybe after meeting your clients. Book the flight now at Airpaz.